Steidl and Steinberg has been helping people resolve their debt problems for over 30 years. With our experience, why go anywhere else? Protect your annual right to appeal. We have a proven strategy to win your assessment appeal. Call us to help you save on your property taxes. We have over 30 years experience in helping people solve their debt problems. The attorneys at Steidl & Steinberg can evaluate your situation and determine which type of bankruptcy is right for you. Dealing with the government can be an intimidating and complicated process. Let us help you break through the red tape. If you believe your County has made a mistake in determining the true value of your property, we can help you to lower your property tax responsibility. Don’t take on your assessment appeal alone. When you fall behind on your bills, it is natural to become overwhelmed with stress and anxiety. There is also a sense that, when you decide to file bankruptcy, it is going to be a very complicated and difficult process. That is not the case at all. When you do something for a long time it’s because you either love it, do it well, or both. At Steidl and Steinberg, our track record has proven we not only love what we do, but we do it well. Since 1985, we have helped tens of thousands of people get a fresh start and have a hopeful financial future. We have also expanded our services to include solving tax problems and handling your property assessment appeals. For many of our clients, financial concerns and fears of foreclosure, repossession and judgments bring them to Steidl and Steinberg. We realize it can be an intimidating and stressful time in your life. Most of our clients have tried a variety of options in order to deal with their debt, including contacting the credit card companies to try to lower interest rates and payments, enrolling in debt settlement programs, taking loans from retirement accounts, trying to take on a second job and trying to get a consolidation loan. Unfortunately, for one reason or another, these options often do not solve the problem. No one wants to file for bankruptcy, but sometimes it is the best option. We will provide the guidance and expertise to give you a stress-relieving fresh financial start. Our website is constructed to help you get acquainted with Steidl and Steinberg, the bankruptcy process and our tax and assessment appeal services. Please remember that nothing in our website can substitute for speaking with one of our Steidl and Steinberg’s experienced attorneys. You may contact us through this website or by telephone at 412-391-8000 or 814-431-1131. 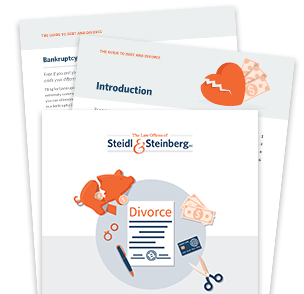 If you are interested, we can set up a free consultation so that you can learn more about your options and the services that are available at bankruptcy attorney Steidl and Steinberg. For some couples, debt contributes to divorce. For others, divorce worsens debt. No matter your situation, just know you’re not alone.